A mother in Quezon City was horrified when she opened a packaged Milo drink which earlier almost caused her 7-year-old son to vomit. The mother, Rissa Gabriel Zaragoza, poured the contents of the pack into a bowl to further examine what could have caused her son to nearly puke. What she found inside the pack is a mass of brownish and gooey material, some of which looked like dozens of round pellets that got lumped together. In a post and series of photos that she uploaded on Facebook, Zaragoza detailed what happened. According to Zaragoza, her son ran to the sink seemingly to vomit after taking a sip from the Milo pack. Her son suggested that the pack may have expired. However, after closer inspection of the drink's packaging, Zaragoza saw that the drink's expiry date is still this coming December 5, 2015. Zaragoza then got a pair of scissors and cut open the pack. That's when she saw the gross-looking and revolting material inside. The mother also claimed that the material smelled putrid which could mean it's already expired or there's something in there that shouldn't be there in the first place. Zaragoza said that she bought the Milo pack along with two others in an SM Supermarket. According to her, the other two packs were fine. In an update, Zaragoza said that Milo Philippines already got in touch with her. The company apologized, got the sample of the product, and promised to perform a thorough test on the material. 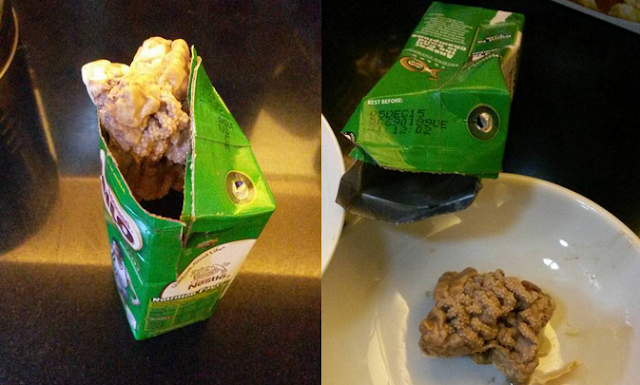 This not the first time that someone found something foreign-looking inside a Milo pack. A few months ago, another netizen posted about something she found inside a Milo drink that's very similar to what Zaragoza found. There are several possible explanations to the gooey material that Zaragoza found in her son's Milo drink. It could be that the drink is indeed expired. It could be that the material got into the pack during production, a production error you might say. It could be that the contents merely curdled but this could be ruled out by Zaragoza's claim that the thing smelled putrid. It could be that the pack was contaminated during delivery or when it was displayed in shelves. There's a chance that mold may have entered the pack. It could also be that the pack is a bogus Milo pack. It has been reported in the past that there are fake Milo drinks circulating in the Philippine market. Anyway, let's hope that Milo Philippines indeed stay to their promise and examine very well the sample of the material that they got from Zaragoza. Below are photos of the material that Zaragoza found in her son's Milo drink. Image credit: Rissa Zaragoza via Facebook. Below is Zaragoza's Facebook post. You can also read her post right on Facebook here. "OMG! I already saw a post about this incident, but never ko naisip mae-experience din namin! My 7 y/o son just opened this Milo tetra pack (expiration date: 05DEC15) and paginom nya nagulat ako tumakbo nalang sya sa sink halos masuka!! He said "Mommy, expired na ata!". When I grabbed the pack from him I immediately check the expiration date, ok, di pa expired! Pero napansin ko mejo mabigat yung pack kaya ginupit ko para mabuksan. That THING is what we found at the bottom of the pack!! It smelled putrid!! If you look closely....parang may eggs na dikit dikit! I don't know and I don't have any idea kung ano to!! POINT is... NAINOM (nilunok pa) ng anak ko yan!! What is that?! I will call the grocery store where I bought the product to inform them about this horror para malaman nila na may ganitong product sa shelves nila!! Sana makarating to sa Nestle Philippines!! My God, what if yung 2 y/o ko nakainom nito?! Sa mga bibili...please be extra careful bago nyo ipainom sa mga anak ninyo. If something goes wrong with my son, I'll see you Milo sa head office nyo!"